A bomb planted under an off-duty policeman’s car contained over 300 grammes of high-grade explosives, a court has heard. The details emerged at the trial of Co Armagh man Sean McVeigh who denies the attempted murder of the PSNI officer at his home in Co Londonderry over three years ago. McVeigh, 37, of Victoria Gardens, Lurgan, also denies a charge of possession of explosives with intent to endanger life. The trial has already heard that the wife of the off-duty officer disturbed a man planting the device under her husband’s car in the early hours of June 18, 2015 at their home in the village of Eglinton. 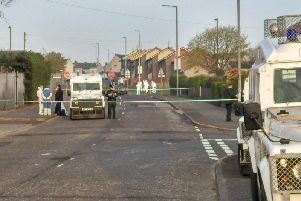 Belfast Crown Court heard that after the woman raised the alarm, police tasked Army technical officers to the scene to examine the car parked in the driveway of the officer’s home. A major in the Explosives Ordnance Division (EOD) of the Royal Logistics Corps said that he arrived in Eglinton from his base at RAF Aldergrove around 5.10 am. He told the non-jury trial before Judge Stephen Fowler QC that he “sent the EOD robot down to the scene to give a live camera feed to make an assessment’’. He added: “Under the vehicle there was a black box, 20cms x 15 cms x 20cms, covered in insulation tape. I assumed it to be an under-vehicle IED (improvised explosive device). He told the court that after waiting a short period of time, he got dressed in a full EOD suit, complete with helmet, a fire mask and forensic gloves and walked down to the driveway of the house to make sure the device was safe. Asked by a senior prosecution lawyer about the make-up of the under-vehicle IED, the officer said that the device contained 321 grammes of high-grade explosives. The court heard the device was also fitted with a detonator, improvised toggle switch, a nine-volt battery, electronic timer and a copper cone. The Army officer said that from his examination the under-vehicle IED was a “viable device’’. He said that after visiting the scene and making sure the device was safe, he handed over 12 grammes of the explosives to a scenes of crime investigator. Asked what happened to the remaining explosives, the major said it was taken away for “disposal’’.